Are you missing Stephen Colbert this week, even given his newly launched “Stephen Colbert Has Stephen Colbert’s Daily Lunch With You, Starring Stephen Colbert” series? Then Stephen Colbert has a treat for you, fans of Stephen Colbert. The future Late Show host has launched a new interactive web game, Escape From The Man-Sized Cabinet. 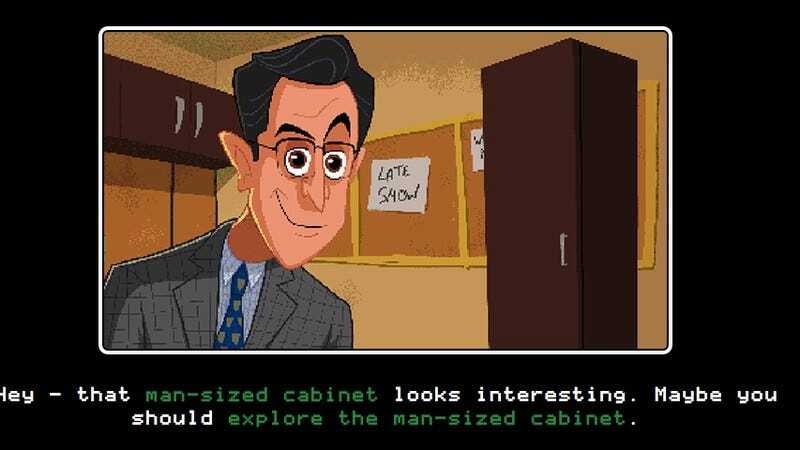 In the choose-your-own-adventure-style game, players can wander around the new Late Show offices, hoping—ideally, at least—to eventually be invited into a man-sized cabinet, a piece of furniture that listeners to Colbert’s newish podcast will be familiar with. Once inside the cabinet, gamers face all sorts of perils, from an “Ice Kingdom-type environment” to possible death from “Cabinet Fever,” but, hey, if you’ve got to go, at least you’re already essentially in a coffin.